What is the System of Fines? The National System of Fines provides the structure for evaluating possible Rules violations. Through a formal system of warnings and fines, it corrects infractions and helps ACH Network participants to remain within the Rules’ boundaries. 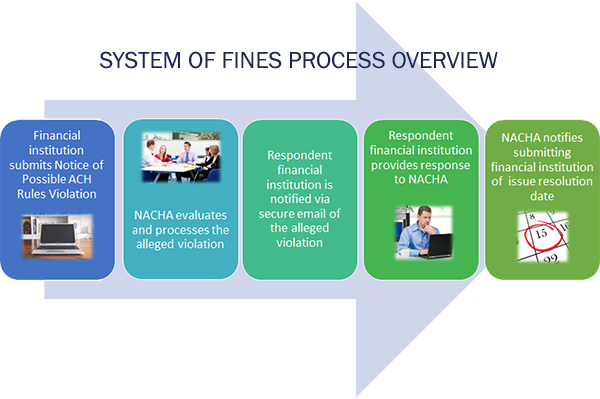 Any violation of the NACHA Operating Rules can be submitted. Submissions regularly involve issues with unauthorized entries, entries initiated to invalid account numbers and incorrect returns. Provides a formal channel for the evaluation of circumstances related to possible rules violations and the imposition of fines if appropriate. You can download the report of possible ACH violation and submit a violation on our website. Or you can email a completed form to NACHA.